I was craving all kinds of things yesterday. Literally, I went from wanting a sandwich to wanting fruit to wanting chocolate. And I got stuck on the chocolate craving. I hate those days, I really don’t know how to control them, but I’m pretty sure it has something to do with me also being unmotivated and bored. Every time I have nothing to do, I get cravings. That might be the culprit. Ehh. Well then that’s why today is a cheat day, so I can get this out of my system. Even the chocolate pudding I made yesterday wasn’t cutting it, I needed some junk in my system and I needed it fast. Such a sad thing to admit. In my head, though, I had an excuse. Pretty good one, actually. I worked out twice yesterday. When I woke up I did Chalean Extreme Burn circuit 3 which consists of weight training. Then an hour and a half later I went to my gym for an awesome Zumba class. I think I deserved to be cut a break today for all the hard work I put in yesterday. Plus, today is not a rest day so more calorie burning was in store for me with Chalean’s Burn it Off cardio circuit and a yoga strength workout (already happened, I do my workouts right as I wake up). I probably won’t do a second workout today since we’re having a pizza night (Giordano’s for the first time!) tonight. Wow, this post is making me sound like a total fattie haha. Oh well, to live and let live. Or.. I don’t know if that quote applies here, but I just wanted to say it. Live life to the fullest. Yeah, that works better. So these cookies came out awesome. At first I was going to healthify them but then I thought “screw it.” Also, I want to get rid of all of the AP flour, regular sugar, and butter I bought because I want to start making more GF, vegan and less processed desserts and baked goods. So that’s a good reason, right? I don’t have room to buy all the flours I need and besides, if I do that, I won’t even end up using the AP anymore and it’ll go to waste. So yeah, little by little, I will get to using all of it and switching to mostly GF baking. With time. I’m not even leading a GF lifestyle but I just really want to be healthier and mostly GF seems like a good way to go. Might as well incorporate that into my own life as much as I can. In a reasonable and realistic way, of course. I am lucky enough to not HAVE to do it, but why not treat my body well if it’s been treating me well all my life, right? I don’t know if that makes sense, but it makes sense it my head. For the frosting, I used the chocolate avocado banana pudding I made yesterday which worked perfectly because it toned down the cookies’ sweetness. Without the frosting, the cookies reminded my roommate, Meredith, more of a brownie. However, put the chocolate pudding frosting on top of the cookie and BAM, now it tastes more like a cream pie cookie, perfect sweetness level but also very filling and satisfying. My other roommate, Ashley, thought it reminded her of a poptart. Interesting perspectives! Both obviously delicious haha. But yeah, the cookie & the pudding frosting- I definitely recommend using the combination together. 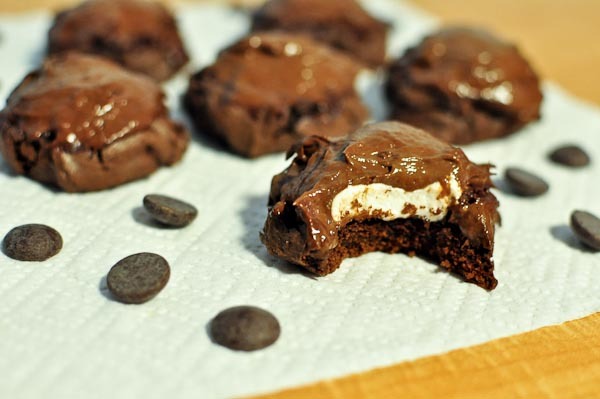 The banana flavor really comes out and creates a lovely combo with the marhsmallow chocolate cookie. I used the large marshmallows for this, but any size will work. Larger marshmallows require a bit larger cookie though, so the recipe might not yield 30 but a bit less (like it did for me). The chocolate batter was SOOOO thick my hand mixer (yeah, like I said before, I don’t have a stand mixer yet. I’m a college student alrightt? Not much room in my little dorm apartment!) was slowing down and I had to have it on a higher setting for it to spin haha. It was fun. My arm definitely got a good workout. 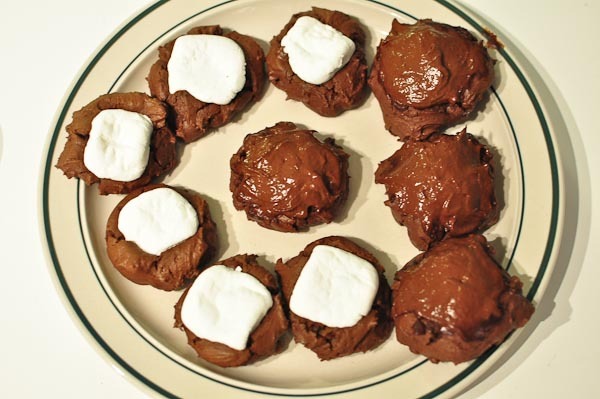 Some of the marshallows were almost too big for the cookies but I managed to make it work. Happy family of two different looking cookies, two different flavors even- both tasting great, but I definitely recommend trying the combo I mentioned earlier. Preheat oven to 375°F. Line large baking sheets with parchment paper or silicone baking mats. 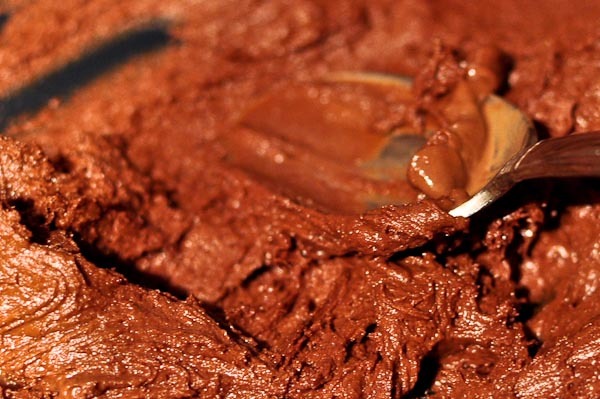 In a medium bowl, sift together flour, cocoa, baking soda, and salt. In the bowl of an electric mixer beat the butter and sugar on medium-high speed until light in color and fluffy, 2 to 3 minutes. Reduce speed to medium-low and mix in the egg, milk, and vanilla. On low speed gradually mix in the flour mixture until combined. Using a 1 1/2-tablespoon ice cream scoop, drop dough onto prepared baking sheets spacing 2 inches apart. 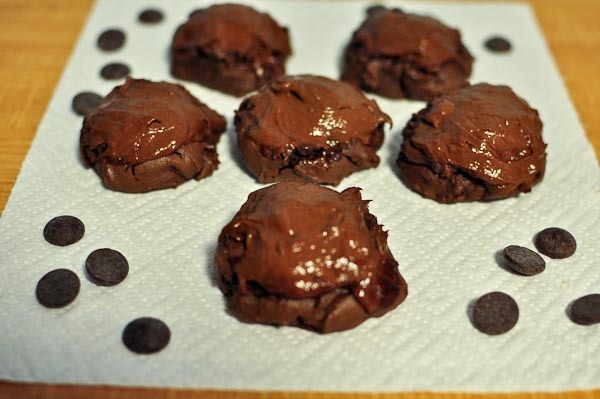 Bake cookies until firm, 8 to 10 minutes. 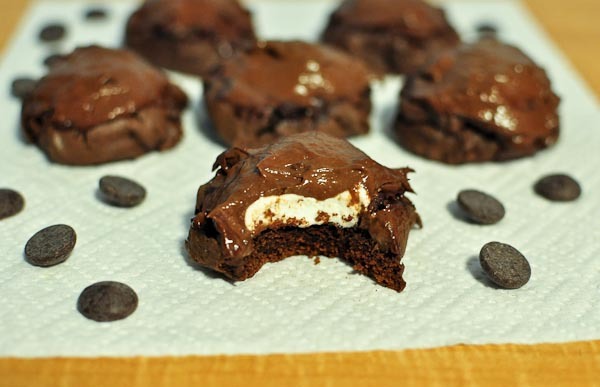 Immediately press a marshmallow half on top of each cookie. Bake until marshmallow begins to melt, 2 minutes more. Let cookies cool completely on baking sheets on wire racks. Try it with the chocolate avocado banana frosting on top, it really combines to be a wonderful flavor mix. 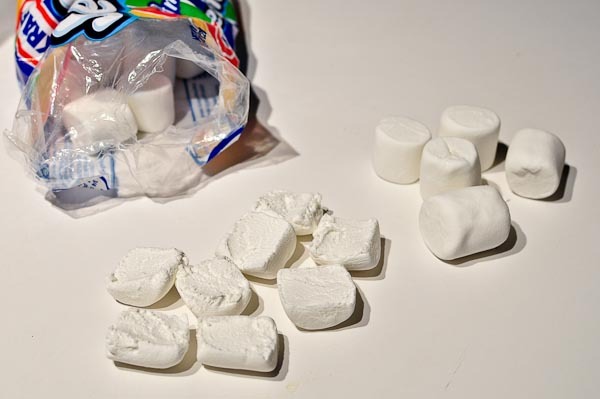 What’s your favorite thing to eat marshmallows with? Do you eat marshmallows often? haha thank you for that, I definitely needed that reassurance 🙂 Back on a good routine tomorrow! Thanks for reading! 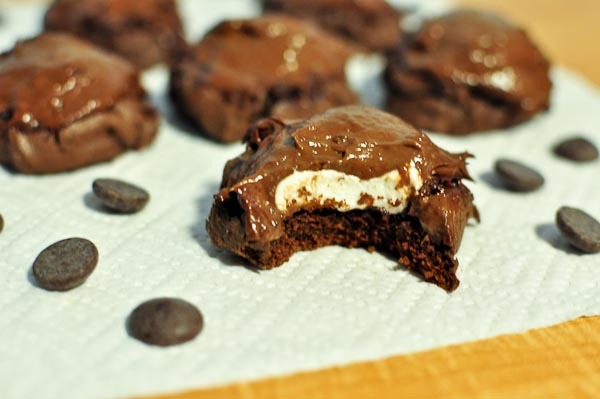 Sometimes my favorite indulgences are marshmallows dipped in chocolate..your cookies are much more creative! Nice recipe! Haha, that’s actually what I also had the night before but since my marshmallows are the big ones, it was too much marshmallow and not enough chocolate for my craving to be satisfied. I definitely have days where chocolate is just NECESSARY and usually it’s better to just satisfy the craving otherwise I end up wandering around my apartment and eating other crap when really…a little chocolate-y treat would have done the trick! These cookies look so delicious. Love that marshmallow surprise! 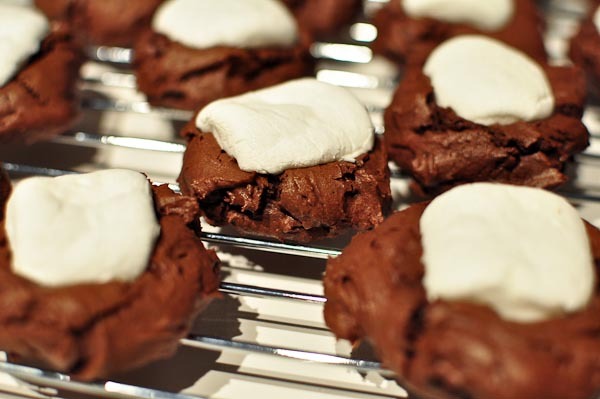 OOoh adore anything with chocolate and ooey gooey marshmallows!! These cookies look sooo crazy decadent and delicious! Thank you so much for linking up to mine & Whipped Baking’s cookie exchange! Thanks for hosting! I love cookies and I love Starbucks so this is awesome. I think I’ll be making more cookies this weekend too so I’ll link up again once I post something new! Thanks for bringing these to our Cookie Party at Foodie Friends Friday! I have picked these as my host favorite and they will be featured on Monday at Daily Dish Magazine 🙂 Keep your eyes on the Foodie Friends Friday Facebook page to see when it goes live! YUMMILICIOUS! What a delicious looking cookie! Thank you for sharing with Foodie Friends Friday. Please come back and VOTE tomorrow AND join us next week for our Garlic Party!